Today we take a look at Looney Labs’ latest party game, Choose One! The decisions you make during this game will stir up conversation at your game night, party, or other social gathering. The box includes a small board that is really more of a score track, with a start space, 1-10 spaces and a finish space. It’s a bi-fold board. 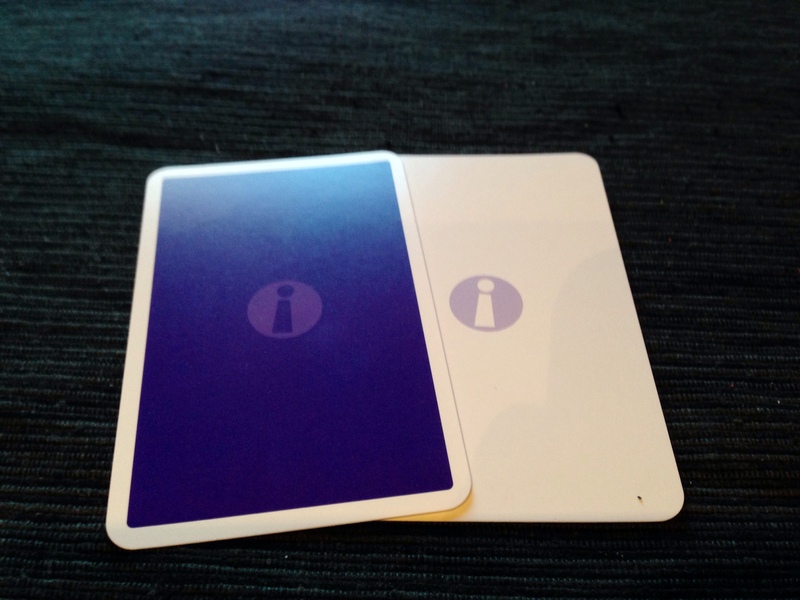 300 Choose One Cards–These are the main/only mechanism to the game; they all have two choices on them: One choice has a white background while the other is purple. 20 Voting Cards–10 white, and 10 purple,and each player receives one of each at the start of the game. 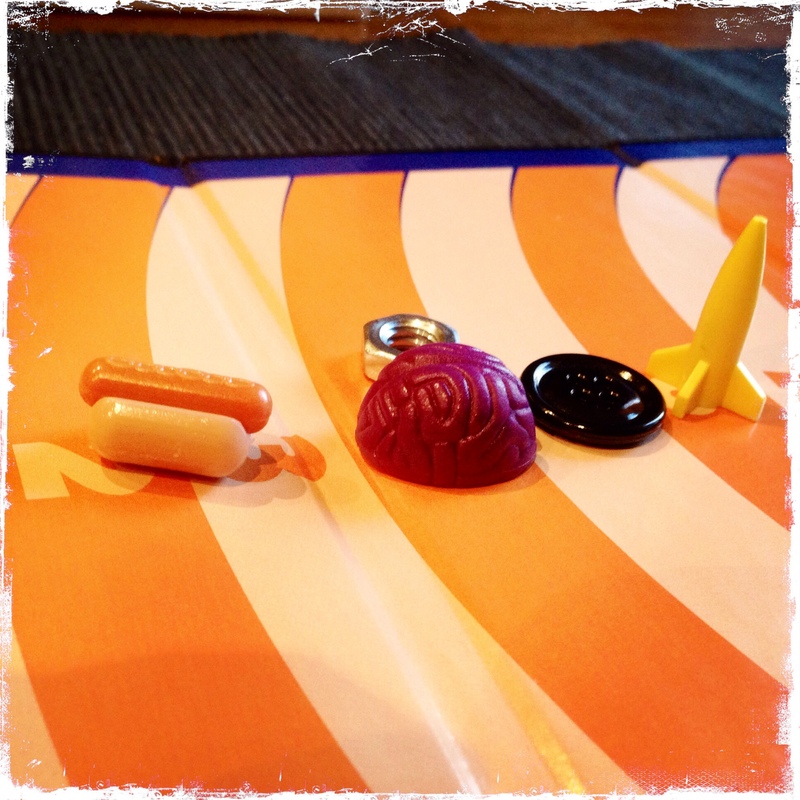 10 Pawns–These are random pieces, everything from a from a wooden car to a plastic hot dog. 1 Felt Bag – To store the pawns in. Setup is quick and easy: Each player selects a pawn and takes 2 voting cards (one white, one purple). Players place their pawns on the “Start” space of the board and you select a beginning player. The first player assumes the role of the “Chooser” (yes, that’s what they call it in the rules), and the Chooser chooses a card, looks at the two choices on the card, and places a voting card that indicates their choice face-down. All the other players reveal their vote (we always did it on a count of three, so that players wouldn’t have an advantage if someone knew the Chooser better than others). After the votes are revealed, scores will be tallied and pawns will be moved. If no one guesses the correct (matching) choice, the Chooser scores 2 points. If at least one player guesses correctly, each player who chose correctly gets 1 point (including the Chooser), but if everybody guesses correctly, then no one scores. Once a player moves into the Finish space, he or she wins. If there’s a tie, play enough extra rounds to declare a winner. Jeremiah–The components for this are really quite simple: The cards are a little thin, but the design is colorful and the colors for your choices are quite easily distinguished. I like the hodge-podge of items that are used for the pawns and the little felt bag is a nice touch. If I had one small complaint about the components, is that typically games of this type also come with a smaller box within the larger box to hold the cards. This does not. So you find yourself passing the game box around or leaving it on the table, it was a little clumsy at times, but definitely did not ruin the experience for me. Firestone–I agree. The different pawns are fun, and certainly in keeping with Looney Labs’ aesthetic. And I agree about the box, too. Even a functional divider would have been helpful, but this was just “Here’s a box full of cards. Good luck keeping them organized!” Not a deal-breaker at all, though. Jeremiah–The concept of this game isn’t terribly original, but it’s still fun. This game makes for a perfect ice breaker for social gatherings. I don’t know that it’s all that great for a gamers’ group, unless it’s used as a filler for a group of gamers who don’t know each other all that well. Firestone–This didn’t work with gamers at all. We ran through a round, realized it was an ice-breaker game and not really a how-well-do-you-know-your-friends game, and quit. The problem is that the questions aren’t equal. 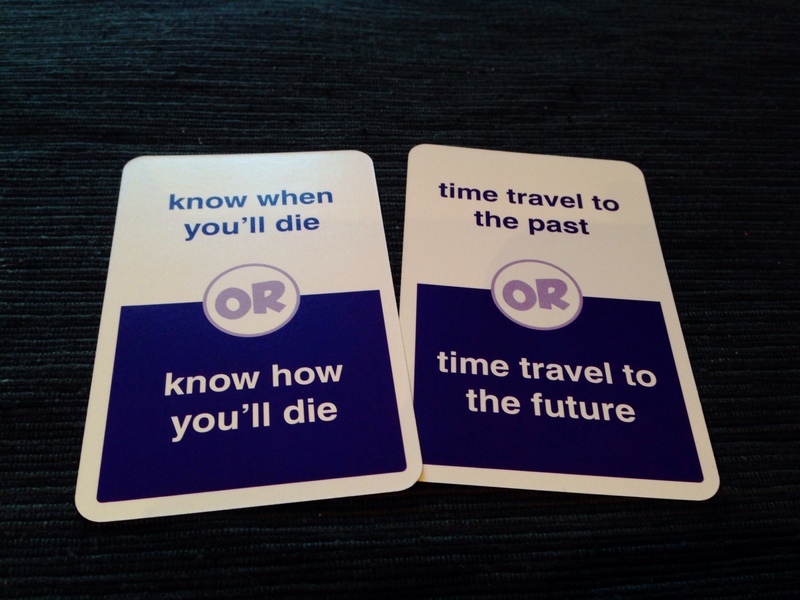 I know…I know… I’m overthinking the cards in a party game. Maybe. Some of the questions create genuine unknowns, where even friends wouldn’t know which you’d choose. “Flower Garden or Vegetable Garden?” or “Butterflies or Fireflies?” Those are choices most of my friends won’t know. But then there are ones such as “Mac or PC?” or “Rock or Country?” Well anyone who knows me is going to know the answer to those. So overthinking? Sure. But I don’t think this is a good game for people who already know each other. It would be a fine icebreaker game. Jeremiah–This game actually came at the perfect time for me: It showed up right about the time I took my new position in youth ministry. I’ve used it to get to know students a little better, strike up conversation and had some good laughs around the table with it. I’ve even pulled random cards from the box and used them during a youth service as an ice breaker to get everyone talking. Firestone–I can see it working well for that type of situation, but not many others. Jeremiah’s Final Verdict–This is a fun game for the right settings. It’s definitely a light party game, but at the same time it’s pretty flexible so those settings are easier to find than you may think. Overall It’s a fun little party game that will strike up great conversation and shared laughter with both strangers and friends! Put this on the table! 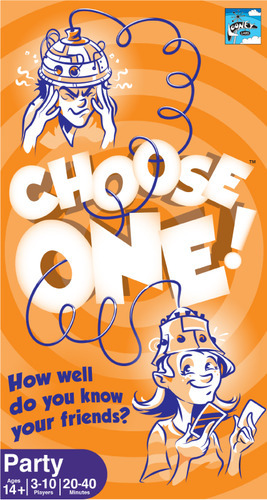 We’d like to thank Looney Labs for supplying us with review copies of Choose One! This in no way influenced our opinions. Have you played Choose One!? Do you agree with us? Let us know in the comments! We’d love it if you subscribed to our little blog over on the right! Also don’t forget to look for us all over the internet, Facebook, Twitter, Instagram, Youtube, and our Podcast!